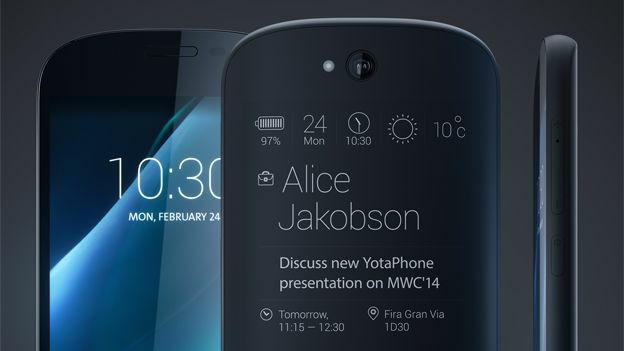 Yota Devices has unveiled a brand-new Android YotaPhone at MWC 2014 boasting, for the first time, a touch sensitive 4.7-inch E-Ink display on the back. The new prototype has been given a significant redesign over the previous model with a curved body containing both the 5-inch AMOLED display on the front and the new 4.7-inch touchscreen EPD on the reverse of the phone. Yota really hasn't skimped on the specs for those displays either with the front-facing 5-inch AMOLED screen boasting a resolution of 1920x1080 at 442ppi making it a serious contender against the Nexus 5 and the new Sony Xperia Z2. On the back you'll find a curved matte Gorilla Glass display which doubles as the back of the phone, inside is a backlit 4.7-inch E-Ink touchscreen display that has a resolution of 960x540. The EPD display isn't just a notifications panel as it gives you access to a huge range of dedicated apps which let you answer phone calls, reply to text messages, read books. Other apps for the rear-display include a FitnessTracker as well as a Maps app and also a Sports Tracker which sends live sports updates straight to the rear-display. The Put2Back feature lets you send any content showing on the 5-inch display to the EPD on the back so if the phone runs out of battery the EPD will remain always-on. Other specs include a Snapdragon 800 quad-core processor, 2GB RAM, 32GB of storage and Bluetooth 4.0. There's also NFC and wireless charging. No word on whether Yota will actually launch the next generation YotaPhone but for the moment this looks to be a significant improvement over the last model.